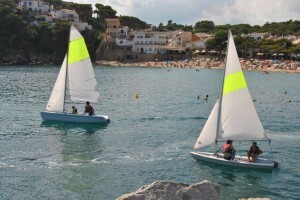 Eschool approved by the Catalan Sailing School. Programme-based classes, Monday to Friday. Please reserve and sign up in advance. The information you provide will not be added to any database and will be used solely to respond to your requests for information. From 1 to 5 weekly ( 15 hours ) From 10 a.m. to 13 p.m.
From 8 to 12 weekly ( 15 hours ) From 10 a.m. to 13 p.m.
From 15 to 19 weekly ( 15 hours ) From 10 a.m. to 13 p.m.
From 22 to 26 weekly ( 15 hours ) From 10 a.m. to 13 p.m.
From 29/7 to 2 weekly ( 15 hours ) From 10 a.m. to 13 p.m.
From 5 to 9 weekly ( 15 hours ) From 10 a.m. to 13 p.m.
From 12 to 16 weekly ( 15 hours ) From 10 a.m. to 13 p.m.
From 19 to 23 weekly ( 15 hores ) from 10 a.m to 13 p.m.
from 4 to 7 p.m.